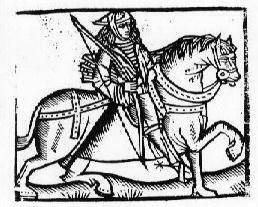 Under a variety of titles -- A Gest, Merry Geste or Lytell Geste --, A Gest of Robyn Hode was printed and reprinted numerous times in the 16th century. The earliest edition dates from around AD 1500, and therefore the Gest is one of the earliest surviving Robin Hood stories. Current scholarship suggests it was written in the latter half of the 1400s, but it was composed around 1400. Also, some historians feel it was compiled from previous, but now lost, ballads. Others have argued that later ballads were cut down from the tales in the Gest. Clocking in at around 13,900 words, it's not only the longest early Robin Hood story, but the longest English outlaw story of its day. So, Robin Hood writers and scholars are bound to be drawn to it. Gest, by the way, could mean story, tale, adventure or in this case, deed. This ballad would not have been sung as later ballads were, but instead would have been spoken. American musician Robert Frank recorded a translated version of the ballad, which he speaks while playing music. Oxford scholar Douglas Gray commented that this is almost certainly how the original tale would have been performed. The Gest is divided into eight sections, known as Fyttes. Here's a breakdown of the main action for you. Fytte 1 -- Robin wants to have a guest before they eat. Little John finds a poor knight in threadbare clothing. The knight's son killed someone in a joust and the knight had to borrow 400 pounds from St. Mary's Abbey, York to pay the bail. Now, the loan is due, and the knight doesn't have the money and will lose his lands. Finding him to be honest, Robin loans him the money and gives him fine clothing. He sends Little John along with the knight. Fytte 2 -- The abbot of St. Mary's and others are eager to seize the knight's land. The knight shows up and pretends to be broke. They show no mercy. And therefore, when the knight pays up he doesn't give them a tip. The knight returns home, collects the money, and makes a gift of fine bows and arrows, to repay Robin. On his way to Barnsdale (Robin's base), he is delayed to help a yeoman in a wrestling match. Fytte 3 -- Meanwhile, Little John goes to Nottingham and enters an archery contest. The sheriff is impressed and drafts Little John into his service. After spending some months with the sheriff, Little John causes trouble, fights and recruits the sheriff's cook and they make off with the sheriff's treasure. Later, they lure the sheriff into meeting Robin Hood. In exchange for his freedom, the sheriff promises not to harm Robin. Fytte 4 -- Waiting for the knight to return his loan, Robin and his men intercept the high cellarer of St. Mary's abbey. The monk is rude and dishonest, and so Robin robs him of 800 pounds, claiming the virgin Mary has sent this payment. When the knight does show up, Robin gives him another 400 pounds. Fytte 5 -- The Sheriff of Nottingham holds an archery contest for a gold and silver arrow. Robin wins the contest. But his men are ambushed, Little John is wounded, and they take refuge at the castle of the knight (now called Sir Richard at the Lee). Fytte 6 -- The sheriff goes to the king for help, and returns to capture Sir Richard. Sir Richard's wife goes to Robin for help. Robin rescues the knight, kills the sheriff and flees to the forest. Fytte 7 -- Planning to deal with Robin personally, the king goes to the forest disguised as an abbot. He makes friends with Robin. They have an archery contest which Robin loses. The knight discovers the king's true identity. Robin enters the king's service. Fytte 8 -- The king and his men disguise themselves as outlaws and go to Nottingham. Robin serves the king for 15 months. Broke and bored, he returns to Barnsdale, reforms the band, and they stay as outlaws for 22 years. Robin is bled by his cruel cousin, the Prioress of Kirklees, and dies. Some of this summary is probably familiar to you. Later ballads are based on the Gest. Many of these incidents appear in children's books, like Howard Pyle's classic The Merry Adventures of Robin Hood of Great Renown in Nottinghamshire. The knight's debt is a major part of Robin McKinley's feminist novel The Outlaws of Sherwood. The archery contest is a staple of nearly every Robin Hood movie, as is the pardon from the king (Edward in the ballad, usually Richard I in the films and novels). Robin and Marian has an unusual take on Robin's death. The 1980s television series Robin of Sherwood starring Michael Praed and Jason Connery borrowed from the Gest in several episodes. The archery contest is in "Robin Hood and the Sorcerer", Robin enters and later leaves the king's service in "The King's Fool", and Sir Richard is in debt to the abbot of St. Mary's in "Herne's Son." And the earlier 1950s TV series, Richard Greene's The Adventures of Robin Hood also borrowed heavily from the Gest. Sir Richard's debt to the Prior of Emmet (as in Pyle's book) is covered in the episode "The Knight Who Came to Dinner". An archery contest and the siege of Richard's castle occur in "The Challenge". There is much debate about when the story is set. or even when it was composed. Some feel it occurs in the 13th century. Others prefer the 14th century. Dates of composition range from before 1400 to the 1460s. And there's much debate over which Edward the king is meant to be. In the early 19th century, Joseph Hunter found the king's journey in the Gest is similar to that of Edward II's. There was even a Robyn Hood serving as a porter in this king's court. However, other details point to the reign of Edward III. Professor Stephen Knight stated in his 1994 study of Robin Hood that the king may have been Edward IV, who was likely the king at the time of composition. But Professor Thomas Ohlgren has recently shown that the Gest may be have performed for the cloth guilds that were founded in the reign of Edward III. Ohlgren shows there are a lots of references which make Robin sound like a cloth merchant of Edward III's day. Even the food Robin serves his guests is taken from the guild menus where this story may have originally been read. At a 2003 conference, Ohlgren revised his opinion and felt that the king in the Gest may have been a combination of Edwards III and IV, as if asking the current king to act like his famous predecessor. Knight feels that the Gest is not entirely reflective of the earliest Robin Hood, and Robin is already slightly "gentrified in the story". The poem does feature a Robin Hood who advocates washing one's hands and taking off one's cap before dining. A most mannerly outlaw. But this is still not a completely civilized outlaw. As Knight also notes [in his book Robin Hood: A Complete Study of the English Outlaw, p.81], the ballad "advocates massive theft from the church, civic insurrection against and murder of a properly appointed sheriff, breach of legitimate agreement with a king, and it imagines that all those things can lead to a lengthy and happy life." Knight also points out that while it sounds better to call the story "the Gest", the proper title is "A Gest", one of many Robin Hood tales. On the other hand, Professor J.C. Holt feels that the story of the knight and abbot is the most original element of the early Robin Hood stories. Yet it also contains pseudo-Arthurian imagery and themes from other outlaw legends. Thomas E. Kelly notes that there are several borrowings from the earlier outlaw romance of Fouke fitz Waryn. "Some of the incidents in Fouke fitz Waryn and A Gest of Robyn Hode are, for example, to close to be accounted for by 'common tradition' or coincidence -- the game of truth and consequences by which those who lie are robbed, while those who tell the truth keep their money; the trick of enticing the enemy into a forest trap by promising him a long-horned stag; the captured king or sheriff swearing an oath not to harm the outlaw and then breaking it; and the wounded sidekick begging the hero to kill him by cutting off his head." -- A Book of Medieval Outlaws: Ten Tales in Modern English, edited by Thomas H. Ohlgren, p. 111. Robin Hood has a strong devotion to the Virgin Mary in this ballad. Several scholars have remarked on how parts of the ballad resembles the miracle tales connected with the Virgin. However, Douglas Gray notes that there are many ironies in Robin's devotion. Perhaps the poem is commenting "look, even an outlaw is more devout than figures of the established church". Also, Robin does use his devotion as an excuse to rob some monks claiming that the Virgin Mary promised him the money. You have the wonder how broad the grin on Robin's face was when he said that. The debates on this ballad are far from over. In 2001, I heard two renditions of the Gest. A CBC radio documentary featured a few lines of the ballad being droned out in relatively flat tones. The Middle English may have been correct, but it was hard to see why such boring words would last through the centuries. But Californian folk musician Bob Frank's lively version with an American twang was like a revelation. The language may have been modernized, but here was the warmth and most importantly the humour of the ballad brought to life. Although the language and musical styles would have been different, Bob's Gest was the kind you could imagine entertaining the angry English peasants, the folks of the manor hall or those in a craft guildhall (depending on what the medieval audience actually was, the subject of yet another debate). At its core, the Gest is meant to entertain. And when read with that in mind, it does. In 2003, Nottingham music professor Paul Bracken played his scaled down version of fyttes 1, 2 and 4, the knight's story. This version had a more English favour, but still captured the essence of the ballad. The Gest with extensive notes and commentary by Professors Knight and Ohlgren is available online at The Robin Hood Project at the University of Rochester. Click here to go directly to the Gest. Click here for Stephen Knight and Thomas Ohlgren's introduction to the ballad. Robert Frank's modern English translation of the Gest is also available on the web. The CD is now available for order on Bob's website. Please visit http://www.bobfranksongs.com. ROBIN HOOD AND OTHER OUTLAW TALES edited by Stephen Knight and Thomas Ohlgren. It's a whopping 700 pages filled with ballads, plays, and historical background. Much of this book is online at The Robin Hood Project at the University of Rochester. RYMES OF ROBYN HOOD; AN INTRODUCTION TO THE ENGLISH OUTLAW by R.B. Dobson and J. Taylor. Alan Sutton: Gloucester, UK, 1989. Originally published by Heinemann in 1976, this is a classic collection of ballads and poems with a wonderful historical introduction. A new edition was released in 1997 with an updated foreword. THE EARLY RYMES OF ROBYN HOOD: An Edition of the Texts, ca. 1425 - 1560 edited by Thomas H. Ohlgren and Lister M. Matheson. Tempe: Arizona Center for Medieval and Renaissance Studies, 2013. In most volumes, the Robin Hood texts are edited - variant versions are combined to "produce the best text", typos are "fixed" and spelling and punctuation is adjusted for a modern audience. All very helpful for the general reader, but those editions don't give a true picture of the original sources. This includes reproductions of the texts of Robin Hood and the Monk (including a previously unpublished fragment), Robin Hood and the Potter, seven different editions of A Gest of Robyn Hode and the three early plays. It is a very useful volume for advanced studies. I'd like to extend special thanks to Professor Ohlgren for e-mailing me his paper "The Merchant of Sherwood: Mercantile Ideology in the Early Ballads". His research has produced some of the most important Robin Hood scholarship in the past half century. This article and other pertaining to the Gest are available online at Robin Hood: The Early Poems. These essays have now been published. 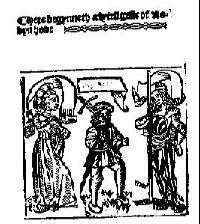 ROBIN HOOD: THE EARLY POEMS, 1465 - 1560 by Thomas H. Ohlgren. Newark: University of Delaware Press, 2007. For more advanced studies, Thomas Ohlgren offers insightful articles on Robin Hood and the Monk, Robin Hood and the Potter and A Lyttel Geste of Robyn Hode. It also includes a linguistic analysis of the texts by Lister M. Matheson. Text copyright, © Allen W. Wright, 1997 - 2005. Click here to learn about the Tip Jar, or click on the button above to make a donation. All text, unless otherwise noted, and title graphics - © copyright Allen W. Wright, 2005.